A sports jacket is a short single-breasted coat, originally men's wear but in the early 2000s worn by both men and women. Similar to a suit jacket in fit, detailing, and fabrication, it is usually less shaped than a suit jacket. Originally intended to be worn in the country for sporting pursuits, the sports jacket is often seen in many other contexts as well. Its nineteenth-century ancestor, the original Norfolk jacket, was made of tweed, checked, or herringbone woolen cloth, and was cut quite differently from the sports jacket of the early twenty-first century. The Norfolk jacket was not simply the jacket of a country suit, but a suit jacket designed with a particular purpose in mind; it was intended for, and could only be afforded by, the rich for leisure pursuits. At its inception, in the 1860s, the sports jacket was part of the hunting attire worn by the Duke of Norfolk. The Norfolk jacket was buttoned high to the neck, had a box pleat centered on its back, and two box pleats in the front. Because of its structure, the jacket was ideal for shooting, with flapped pockets used to store ammunition and provisions; its belted waist allowed for full mobility of the hunter's arm while he was taking aim with his gun. These sports jackets would often be worn with knickerbockers and deerstalker hats or sometimes, less frequently, with bowler hats. Cut from heavy wool or tweed in autumnal and rural tones such as mustard, ginger, green, and brown (very different from the business stripes and plain colors worn in the city), the sports jacket was rarely worn with another piece of outerwear as it was itself specifically designed for the outdoors. By the early twentieth century, the Norfolk jacket, still associated with the rural life enjoyed by the landed gentry and the rich alike, had been modified from its original design. The signature belt and box pleats were removed, and it began to be worn for other country activities, including as garb for spectators at sporting events, and also as an alternative to the traditional suit jacket. The shoulders were fuller, sleeves wider, and the armholes larger. The sports jacket gave men the opportunity to dress differently after work or on the weekends. Just as the lounge suit was beginning to replace formal suiting worn to the office, the tweed jacket became an acceptable part of casual dress. This new sports jacket, as worn by urban consumers, was cut in a style more akin to that designed for horse riding and was usually worn with flannel trousers. The New Look sports jackets were typified by angled waisted pockets, a breast pocket, and, often, leather buttons as well as a swelled edge instead of the customary plain buff edge associated with suiting. Further features were developed such as leather patching at the cuff or even on the elbow. The desire to maintain a clear difference between the attire worn at work and in one's leisure time has clearly driven the sales of the sports jacket. However, many creative professions, such as advertising during the 1960s, began to allow their staff to wear the sports jacket as business clothing. For many, it became an expression of freedom and individualism. The informality of the look gave men the opportunity to be more creative in their choice of fabrics and patterns than they ever could with a formal suit. Even the late Duke of Windsor commented that the brighter a pattern on a sports jacket, the better he liked it. In the early 2000s, sports jackets are available in wide choice of patterns and colors. As the idea of the separate jacket has spread throughout the world, other materials have been employed to allow for climatic variations. Seersucker has become a favorite in the southern United States. Deriving its name from the Persian shlr-o-shakkar (literally, milk and sugar), the blue-and-white-striped jacket in this lightweight fabric has become an American classic. The Italians are also noted for making up exceptional lightweight sports jackets in soft fabrics. However, for many, traditional sports jackets cut either on London's Savile Row or bought from a tweed expert such as Cordings of Piccadilly remain classic staples. In these versions, buttons should be made of natural materials, especially horn; the lining should be sewn into the jacket by hand; and should feature working cuffs (that is, with buttons that fasten into buttonholes rather than being sewn on simply as decorations). As with many other articles of clothing that once were exclusively men's wear, sports jackets have been modified in cut and style for women. The women's sports jacket, worn with trousers or a woolen skirt, forms the foundation of a distinctive style that is simultaneously dressy and relaxed. For men, the older rule that a sports jacket should be worn with knickers or with a pair of gray flannel trousers has been relaxed. It is fully acceptable to wear a jacket with a smart pair of moleskin, corduroy, cavalry twill trousers, a simple pair of plain woolen trousers, or even jeans. With the increased popularity of casual wear, for many men in the United States and Europe, the combination of a sports jacket and slacks is deemed a somewhat formal look. See also Sport Shoes; Sportswear. Hardy Amies. A, B, C's of Men's Fashion. London: Cahill and Co. Ltd., 1964. Byrde, Penelope. The Male Image: Men's Fashion in England 1300-1970. London: B. T. Batsford, Ltd., 1979. De Marley, Diana. Fashion for Men: An Illustrated History. London: B. T. Batsford, Ltd., 1985. Keers, Paul. 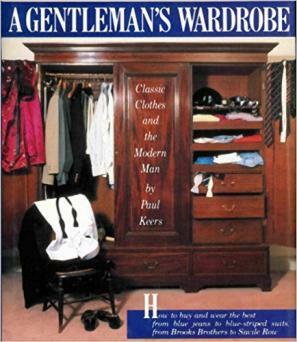 A Gentleman's Wardrobe. London: Weidenfield and Nicolson, 1987. Roetzel, Bernhard. Gentleman: A Timeless Fashion. Cologne, Germany: Konemann, 1999. Schoeffler, O. E., and William Gale. Esquire's Encyclopedia of 20th Century Fashions. New York: McGraw-Hill, 1973.